Roller Skate Speed Skate Wheels are wider than most roller skate wheels for better balance, especially on the crossover at the turns on the roller skate track. Hard wheels will slide which is great for an excellent skater but will inevitably slow down a skater will less skills. For roller derby skaters, the tall wheels are faster as are all roller skate wheels, however, wider wheels are for blockers and narrow speed wheels are more appropriate for jammers. And then there are jam skaters, many of which prefer wide wheels for a more balanced bounce. Sure Grip Ice Speed Wheels - 62mm x 42mm (95A) 8 WHEELS at this price. 4 pack.Treaded wheel surface for derby, jam and speed. 62mm X 38mm, 92A. 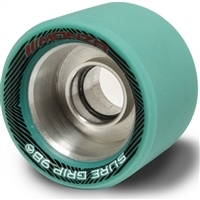 Sure Grip Monza Speed wheels 62mm X 42mm from the skate experts at Sure Grip. Sized for superior balance and speed.8-packs only. Machined in Southern California. 62mm x 42mm profile 93A. from the skate experts at Sure Grip. Sized for superior balance and speed.8-packs only. Machined in Southern California. Sure-Grip Twister skate wheels for speed indoor speed skating. Great for speed skates! 62mm 96 A. Sold in 8-packs only. Rollerbones Roller Derby Wheels Pet Day of the Dead 59mm - The best roller derby wheels for fast roller derby track skating. The best roller derby formula for roller derby track skating. Manufactured in the USA, Radar Villain Derby Wheels are grippy, narrow and fast. Race with these bad boys and watch the competition get stole on. 62mm X 44mm Various Hardnesses Sure Grip Fugitive wheels have the perfect balance between grip and rebound in a indoor speed wheelSold in - 8 packs with 3 durometer choices. Reckless Derby Wheels MORPH - 59mm x 38mm SET OF FOUR. Two urethane durometers in each wheel! Reckless Derby Wheels Morph solo - 59mm x 38mm SET OF FOUR. Allows for more controlled slides and predictable response, with less "bite" than the Morph dual hardness wheels. Reckless Derby Skate Wheels IKON XE - 62mm x 38mm SET OF FOUR. Lightweight and slim for quick takeoffs and turns. Sure Grip Rollout Wheels - 4 set Rollout wheels are made from the freshest ingredients produced here in the Southern California. Ninja cut at 59mm x 38mm (LOW), these wheels feature a unique urethane compound that is only available from Sure-Grip. Sure Grip Rollout Wheels - 4 set Rollout wheels are made from the freshest ingredients produced here in the Southern California. Ninja cut at 62mm x 38mm (MID), these wheels feature a unique urethane compound that is only available from Sure-Grip. Sure-Grip Twister skate wheels for speed and derby skating. 62mm tall and 42mm wide. Sold in 8-packs only. The 62mm size is tall enough to create that long glide for speed. The 42mm width is best for stability - just what the team needs to block AND skate fast! Nylon core means lightness which also translates into greater speed. Reckless Derby Skate Wheels EVADER- 59mm x 38mm SET OF FOUR. Pick the color that suits your skate style and surface best - 4 packALL NEW light weight urethane that has NEVER been used on any other wheel on the market!